Dishonored 2 is set to release exclusively for PlayStation 4, Xbox One, and PC on November 11, 2016 and thus you have enough time to decide which edition you want to buy. In addition to the Standard Edition, there will be a Collector's Edition, which includes the main game with pre-order bonuses. The Standard Edition of Dishonored 2 has been confirmed for the three major platforms: PS4, Xbox One and PC. If you buy this version after the release, then you will get nothing more than the main game. 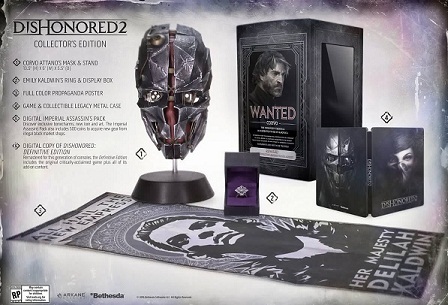 However, if you pre-order the Standard Edition, then you will get the main game, Dishonored: Definitive Edition as well as pre-order bonus. Since the second part of the game refers to the first, it is definitely worthwhile to play the first adventure. - Legacy Steelbook: The game comes in a chic Steelbook on which are the portraits of Emily Kaldwin and Corvo Attano. - Corvos Mask: The mask of Corvo is included. (Dimensions: H: 34 cm, B: 15 cm, D: 14 cm). - Emily Ring: this ring also included, provided that you ordered the collectors edition. It comes in a black purple box and consists of a zinc alloy. - Propaganda Posters of Karnaca. - Dishonored - Definitive Edition: download code for Dishonored including all add-ons.